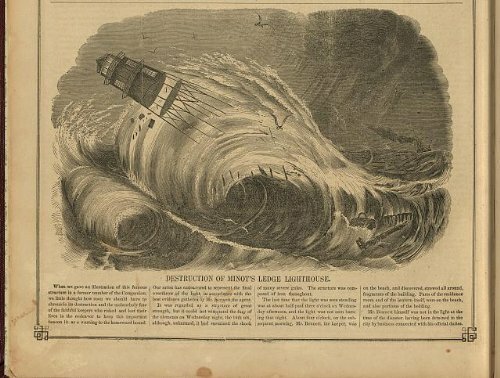 Between 1832 and 1841, forty vessels foundered on the rocks at Minot’s Ledge off Cohasset and Scituate, and in the late 1840s, a lighthouse was built on the ledge. It was lit for the first time on January 1, 1850. A fierce nor‘easter hit Cape Cod Bay on April 16, 1851, bringing with it the highest seas ever recorded to that time. Late that night, the newly-constructed Minot’s Ledge Lighthouse collapsed and toppled into the surf. The lighthouse was manned that night by the lighthouse keeper’s two young assistants, Joseph Wilson and Joseph Antoine. They kept the light burning into the night. The tide reached its height around midnight and around 1:00 a.m., the lighthouse’s bell was heard to ring repeatedly. Soon thereafter, the iron supports of the lighthouse snapped, and it toppled into the sea. It appears as if Wilson and Antoine escaped the lighthouse structure into the water, although neither survived. Antoine’s body washed up at Nantasket; Wilson made it alive to Gull Rock in Cohasset Harbor but died of exposure before he was discovered the next day. The note in the bottle was given to the Hingham Historical Society in the 1920s by a local historian from Gloucester. This entry was posted in Uncategorized and tagged Cohasset, lighthouses, Minot's Light, nor'easters, shipping.